Newport RI beaches have been spoiled by not only miles of unspoiled coastline, but warm ocean waters as well. As one of the last stops for the Gulf Stream current that starts in the Florida straits and juts out across the Atlantic to southern England, Newport's water temperatures often rise above 70 degrees on the beaches in the months of July and August. Sometimes it even warms enough to swim by Memorial Day! At the end of the season in September and October, the ocean water is often well into the 60's still and many people swim the beaches until the last weeks of October. 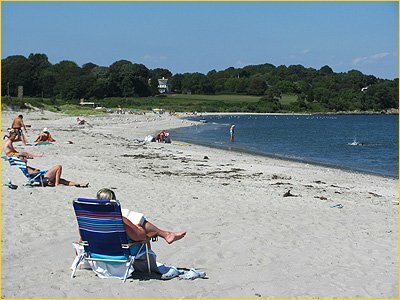 Three of the beaches in Newport RI lie in a row, separated by peninsulas of land and rock that jut out into the sea. As a result, many local people refer to the beaches as 1st, 2nd and 3rd. They are noted below to help you get to the right beach when you're here! Area beaches range from small intimate coves to mile-long stretches of gray-white soft sand beach with varying degrees of surf. The highest waves on Newport's beaches often occur away from the beaches themselves and closer to the rocky outcroppings of The Cliff Walk, Sachuest Point National Wildlife Refuge, and Brenton Point State Park where you may find small sandy areas to enjoy the water and surf. Newport's beaches tend to lie in more protected inlets, offering decent waves for both surfers and families looking to have fun in the waves. Expect to find wave heights anywhere from less than a foot to about four feet preceeding coastal storms with a strong onshore flow or the day after a storm departs the area. Visitors to the beaches in Newport RI can enjoy a varying level of services, from nothing at some to full concessions, parking and bath houses at others. Easton's Beach even offers a beautiful carousel as well as a kids playground area. The list below can help you decide which is the best beach in Newport for you. An important thing to know is that most beaches don't allow alcohol or pets, especially during the active summer season. Some beaches in Newport relax the pet policy in the off-season on a beach-by-beach basis. Cars are also prohibited on all beaches, and for good reason. The sand tends to be deep and very soft, fun for the toes but not so good for car tires. Although you will find most Newport beaches packed throughout the warm sunny days of summer, after 6pm is a great time to stop by for a swim or a walk. 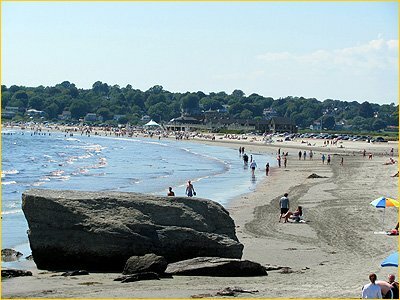 Most beaches stop charging for parking at 5pm, a fun (and FREE) way to spend a couple hours after your day's activities around Newport. 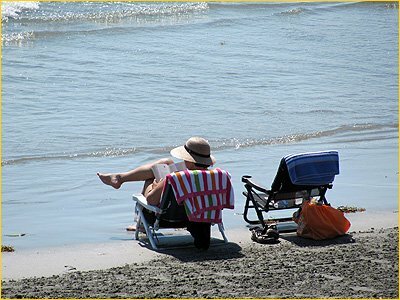 The best kept secret about exploring our beaches is that the best time to experience them is AFTER Labor Day, when the crowds (and the parking fees) have gone. The ocean is still quite warm and swimmable, the sun still strong and there may only be a few people on a mile stretch of sand. It really takes enjoying the beach to a whole new level... we strongly encourage it. 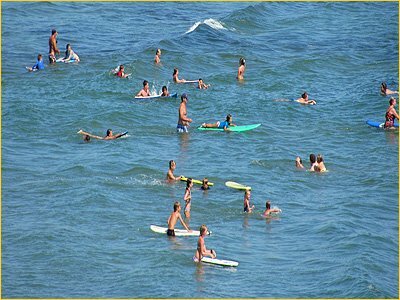 For the younger crowd looking to people watch, Newport beaches during the summer months will not disappoint, with thousands of visitors on any given Saturday or Sunday. Weekdays tend to be less busy, but by no means empty. The beaches we've listed below each have something special, depending on what you want to do. No matter what you choose, Newport definitely has you covered in the beach department: young, surfers, family with kids, romance and more! Daycations are a popular choice, and visitors to the island can depart from Newport or Fall River, MA to enjoy shopping, dining, hiking, biking or relaxing on the beach. Transportation around the island is fun and easy! Choose to rent a bike or a scooter, or get around via taxi. The ferry features a bar that serves their legendary Bloody Marys, great snacks and spacious and comfortable seating. 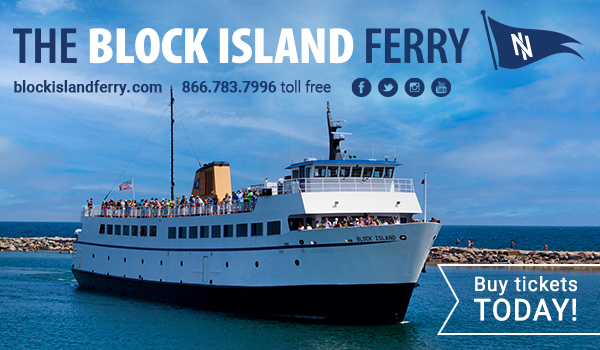 Don't miss a chance to enjoy the relaxed island lifestyle that is Block Island! Newport's largest beach and recreation area. Only area beach that has a carousel, aquarium, rentable beach houses and food concession area. Known for its twin lobster rolls, served up daily at a price that can't be beat! Great for kids and families with all the extra activities and food options. Parking fees range from $10 on weekdays to $20 on weekends/holidays and season passes are $40 for residents / $80 for nonresidents. About a 15-minute walk from downtown Newport or a 5-minute bike or taxi ride. This is a very small beach sometimes referred to as "rejects beach" located at the intersection of Bellevue Avenue and Ocean Drive. Accessible only by foot or bike, it is a great place to stop on a bike ride and relax and watch the surf. The larger area of the beach past the rocks is private and part of the Spouting Rock Beach Association. FREE. About a 15-minute bike ride from downtown Newport or a 10-minute taxi ride. Please Note: there is NO parking anywhere in the near vacinity for vehicles. Bikes and scooters may find a spot right at the beach. Located just beyond Bailey's Beach on Ocean Drive, Gooseberry is a great family beach because it lies in a protected cove away from high surf. This beach tends to be a little less crowded than the large beaches in Middletown and is a shorter drive with less traffic too, especially on summer weekends. Fees are $20 for parking or $250 for season pass. About a 15-minute bike ride from downtown Newport or a 10-minute taxi ride. 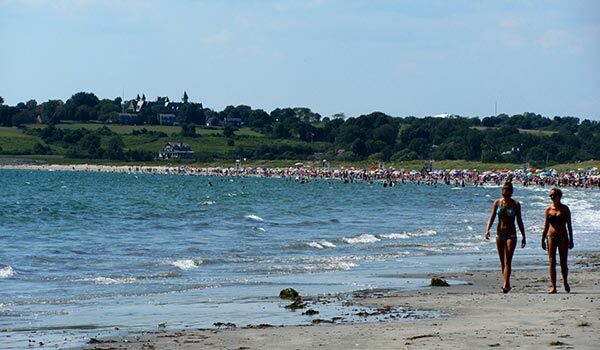 Of all the Newport RI beaches, Second Beach is the largest and boasts the greatest surf. Composed of fine sand, the beach concession area offers visitors food, bathrooms and showers. 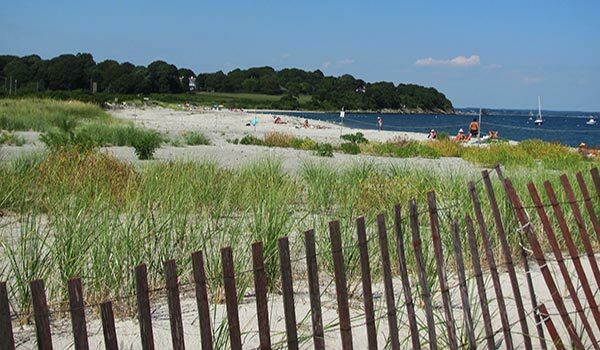 Popular with both families and singles, this beach abuts the Norman Bird Sanctuary and Sachuest Point National Wildlife Refuge. Parking fees range from $10 on weekdays to $20 on weekends/holidays and season passes are $70 for residents / $140 for nonresidents. About a 15-minute bike ride or 5-minute car/taxi ride from downtown Newport. TIP: If you purchase a season pass for this beach, you can use it at Middletown's 3rd Beach as well, giving you options on any given day. 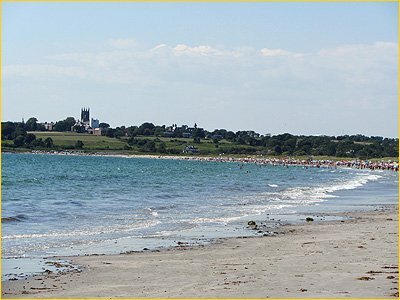 Situated on the other side of Sachuest Point lies Third Beach, a favorite of windsurfers and families. Set in a cove, expect to find low surf at this beach with just the right wind offshore for kitesurfing and windsurfing. Parking fees range from $10 on weekdays to $20 on weekends/holidays and season passes are $70 for residents / $140 for nonresidents. About a 20-minute bike ride or 10-minute car/taxi ride from downtown Newport. TIP: If you purchase a season pass for this beach, you can use it at Middletown's 2nd Beach as well, giving you options on any given day.